Happy Sunday! Do you ever feel like your life is like this sign--like it is moving along smoothly and then all of sudden a curve is thrown at you that slows you up and changes your course? I think we all realize that unexpected things are bound to happen, but they still catch us off guard and are challenging to maneuver through. Here's the thing--God KNOWS the curves are coming, he KNOWS what lies ahead around the corner. And because He KNOWS and determines our steps, we do not need to be fearful of the changes and the unexpected turns. We need to trust his plans, trust that even though our path may be different than we planned, He loves us knows what we need. 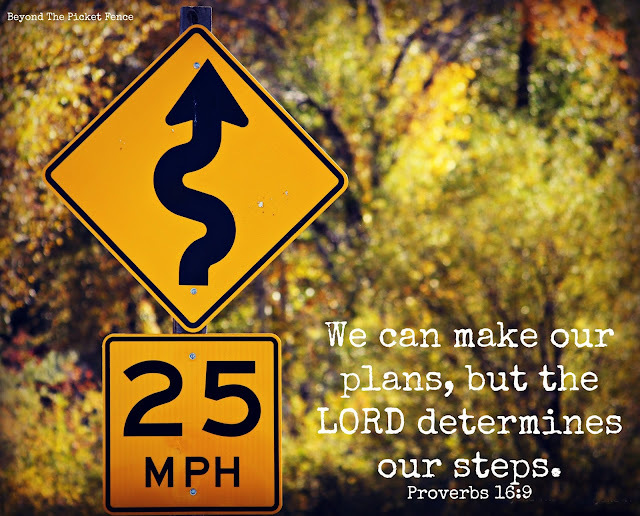 When we believe this, life's twists and turns may slow us down, but we can be at peace, knowing God has determined our path.